David and Iain spent the morning exploring the town centre on foot, having lunch, writing postcards, doing the usual tourist stuff, etc.. Didn’t get much riding done before 1pm. Meanwhile Ian and Alex joined the ADFC Aachen “brisk” ride. 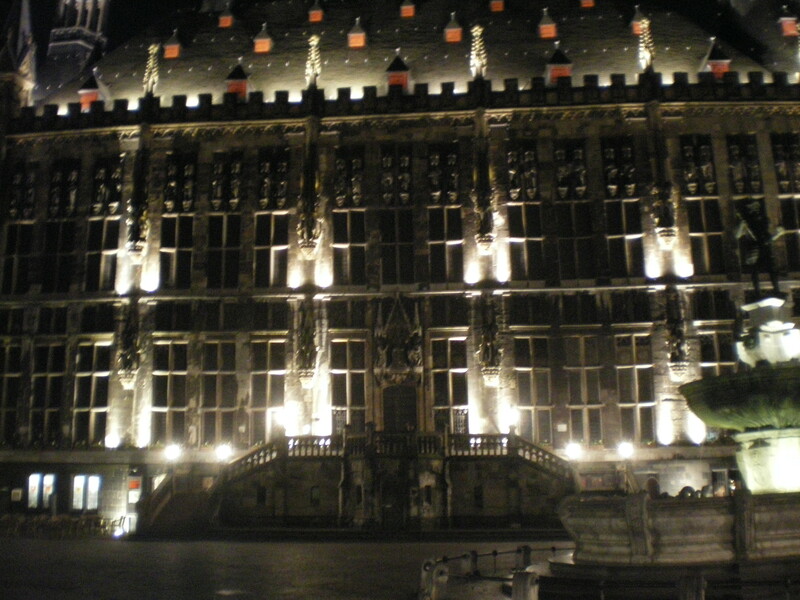 This was to be a circumnavigation of Aachen around seven of its high points! 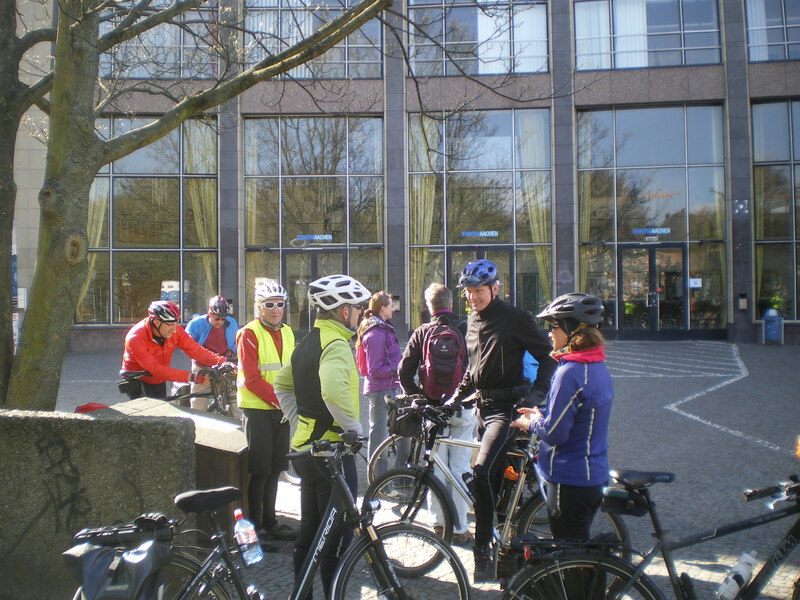 Sabine took us to the meeting point – the Audimax building of the University of Aachen – where the ride was, in fact, jointly organised by the ADFC and the university cycling club. As a result, the two of us sent the average age soaring! The route was up-and-down and up-and-down to say the least and the fit young German cyclists were kind enough to wait once or twice for the oldies to catch up! It was pretty much non-stop pedalling from 10.00 a.m. to 2.30 p.m. with just time to eat a chocolate bar and take a drink of water. But it was brilliant! 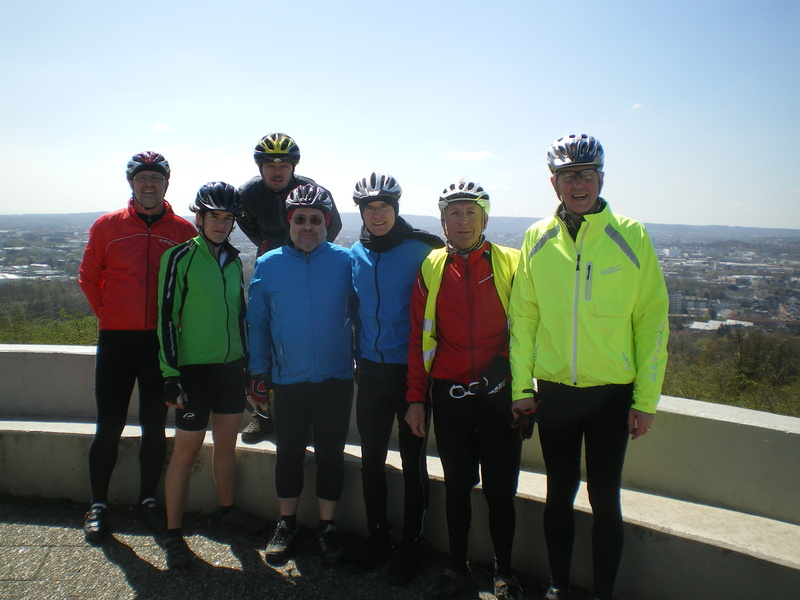 After the Lousberg – yesterday a mighty hill, today just a warm-up – we had an idea of what might be in store. Next was the Dreiländereck – the hard way – but with time for photos. Meanwhile, Iain D had met up with Phil, Rowan and David and had ridden over to the shop to collect David’s bike, complete with new Shimano bottom bracket. Even out of hours the shop serves customers as they’ve seen fit to install an inner-tube vending machine on an outside wall. Couldn’t see an airline though. Got a quick tour of the southern part of Aachen from a former resident (i.e. Phil) on the way to the Hbf, passing the ADFC’s local HQ in the Welt Haus (“World House”) on the way. This is a former council-occupied building that is now leased out to a number of environmentally- or socially- aware orgainsations (think Greenpeace, unemployed-workers-cooperative cafe, etc.). I can’t readily think of a matching example here in the UK. So the afternoon ADFC ride was a “beginners’ ride” – via an easy route as the morning adventurers noted – up to the Dreiländereck/Dreilanderpunkt/Point-Trois-Frontieres which, as its names suggest, is where three countries come together at a single point. 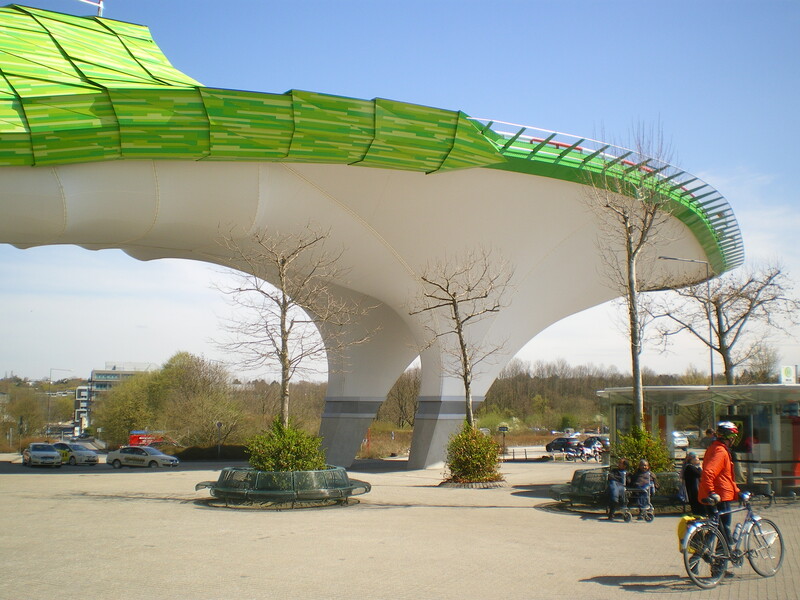 The ride started by crossing town to the University Hospital (Aachen has one of the largest technical universities in Germany, and also one of the largest university medical centres) to see if anyone else was wanting to join the ride (there were about 30 of us by this point). The recently installed helipad (known as the “helping hand”) has to be seen to be believed – it’s bright green and looks like a crocodile’s head. Mind you, the whole hospital is “Pompidou Centre” style with brightly-painted external pipework. Another thing we don’t usually see on our rides is someone taking a cigarette break – obviously not all German cyclists are health freaks. 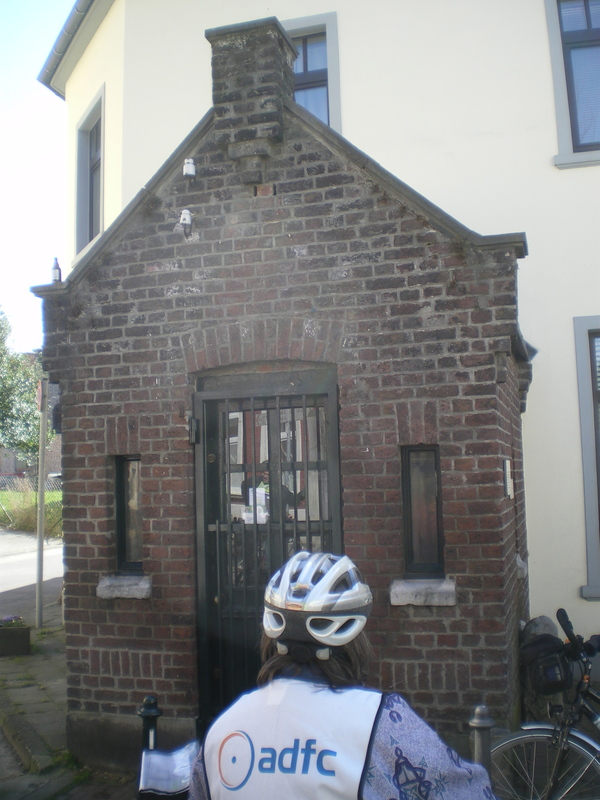 We climbed our way up through the Dutch town of Vaals, stopping at an old border point, and continued to climb through woodland to the point itself. It was also getting warm again. With not much to see (it’s more of a plateau than a point), and the service from the frites counter being appallingly slow (some of us – who had not had lunch – persevered), we headed downwards on forest tracks through a half-marathon that was nearing its end and paused, once again, near another old border crossing. At this point we had to separate from the ADFC group as we had to get back to our respective bases and freshen-up for the evening meal. A single Endomondo route for the two rides is here – 52 miles. 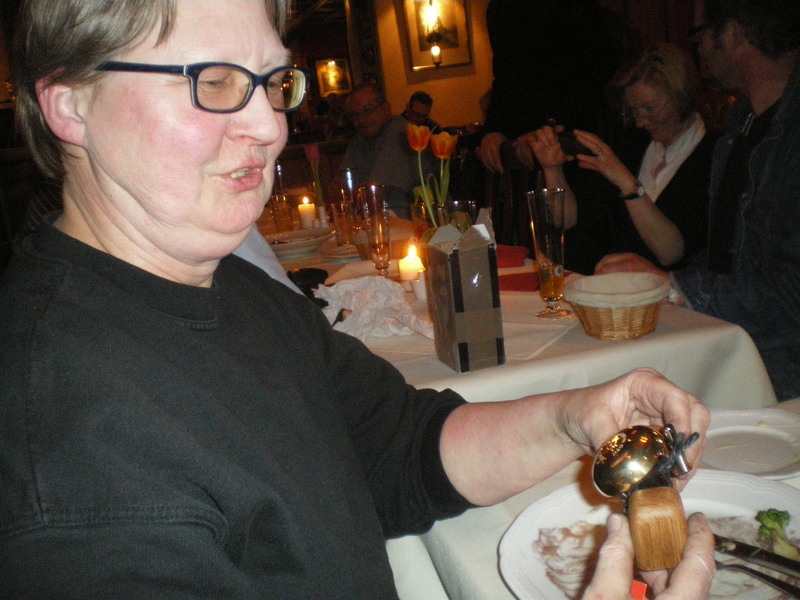 This is supposed to be a ride report, so I’ll skip most of the details of the meal except to say that the gift that we had sourced for our host group – a beautifully engraved bell – was handed over and much appreciated by the ADFC members present. 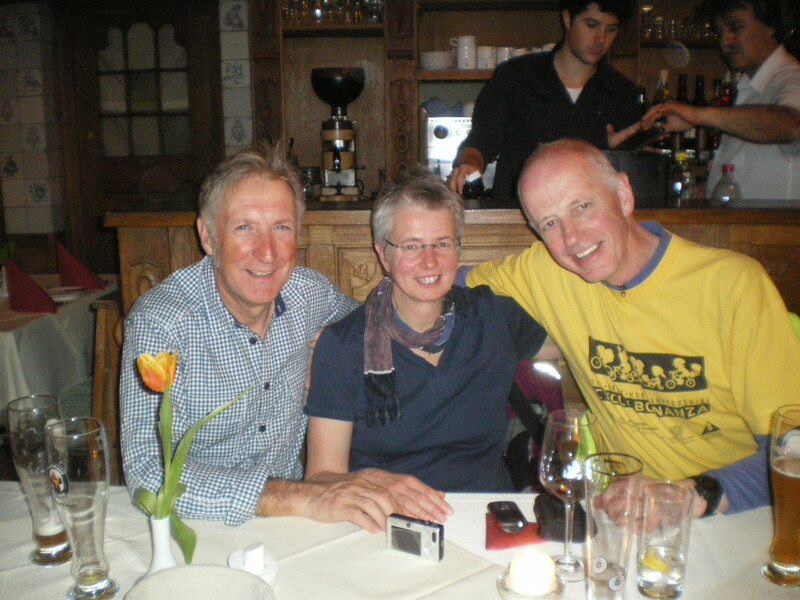 I also still owe Brian for my share of that … I did enjoy the ride “home” though, Elke leading the way through the dark and silent streets of Aachen and us not seeing the cobbles until it was too late. Connie (bike mechanic extraordinaire) inspects the presentation bell! 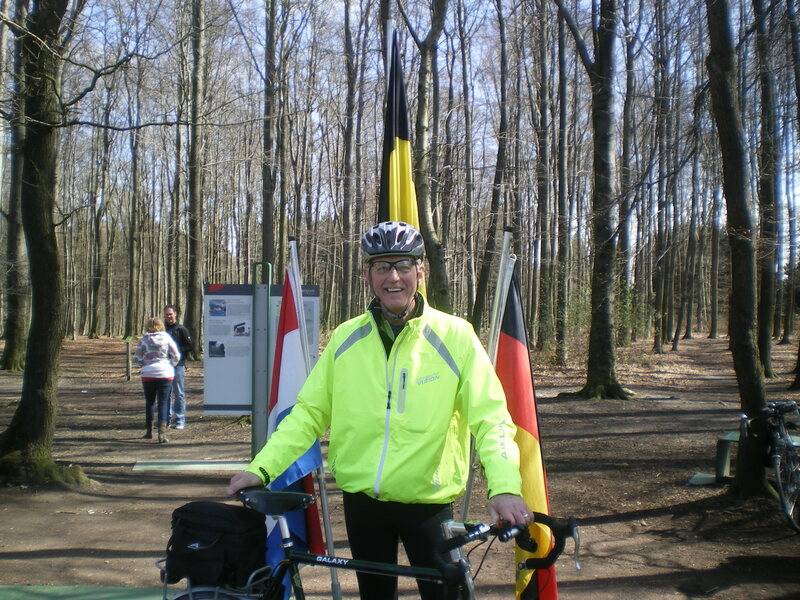 This entry was posted in ADFC, ADFC Aachen, CTC Northampton, CTC Tour to Aachen, cycling and tagged Aachen, ADFC, Audimax, CTC, Dreiländereck, helipad, Northampton, Vaals by ianmac55. Bookmark the permalink.